Is There A Best Time Of Year To Sell My House? Recently a reader asked me "is there a best time of year to sell my house?" First of all, I love receiving questions from readers. It is what keeps the Tallahassee Real Estate Blog fresh and focused on what really matters in the housing market. So today I am going to provide a "time of year" answer that is reinforced with data from the Tallahassee real estate market. I get this question around this time every year, why? Because with Halloween only days away and Thanksgiving just around the corner, Tallahassee is moving into the Holiday season that extends through December. As a community, we seem to embrace this time of year as a chance to focus on family, friendship and all the things that make living here so wonderful. So putting a house on the market in November seems to interfere with the festive mood, right? If there is one thing I have heard for the past 22+ years as a real estate agent in Tallahassee, it's "we're going to wait until after the holidays to list our house for sale." The following real estate graph is interesting, because it contemplates the best time of year to get a home sold. It does not merely look at the raw number of houses that sell (everybody hears that Spring is when the most houses sell ... and that is true), rather it looks at the percentage of homes that are on the market that actually sell. 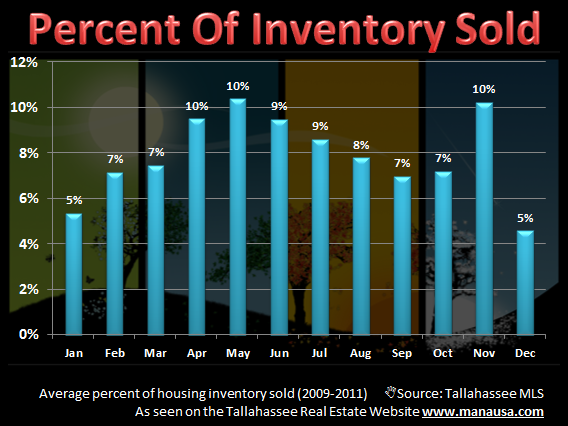 Think of it as a measurement of the turnover rate for houses listed for sale in the Tallahassee MLS. Well surprise, surprise. November and May both show the highest percentage of houses selling (compared to the number of houses for sale at the same time). How could this be ... everybody knows that the buyers are out in the Spring, right? Should I Sell My House Or Should I Wait? November is tied as the best month of the year to get a home sold. Why? Because you will have less competition. Whether we are in a buyer's market or a seller's market, there is a big group of homeowners that will wait for the Springtime to put their home up for sale. By listing your house for sale now, you will not have to compete with this flood of homes that will hit the market. There are plenty of buyers in the market this time of year, and with reduced inventory, our graph shows your chances of selling a home are as good now as they will be in May. And they are even better than every month in between. So if you are pondering the question "should I sell my house now or wait," just drop me a note and we can schedule a time to review your home and your situation so that you can make a better informed decision.